Iran’s ominous rhetoric about making the OPEC+ countries “pay” for their “treachery” to it and hinting at taking action to stop Gulf exports has had its desired effect in raising the oil price, and similar such statements in the run-up to the November reimposition of US sanctions against the country’s energy industry should also be interpreted as attempts to manipulate market speculation and squeeze as much revenue as possible from this resource while Tehran still has the opportunity to do so. “Anyone trying to take away Iran’s oil market (share) would be committing great treachery against Iran and will one day pay for it”, and while not naming the OPEC+ duopoly’s leaders of Russia and Saudi Arabia, it was obvious who he was referring to. “The Americans have claimed they want to completely stop Iran’s oil exports. They don’t understand the meaning of this statement, because it has no meaning for Iranian oil not to be exported, while the region’s oil is exported”, which was widely interpreted as a threat to interfere with Gulf exports despite Tehran’s official claims to the contrary. 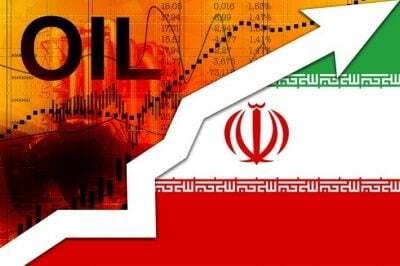 The sending of passive-aggressive messages by Iran isn’t anything new, nor is the state’s formal denial of their implied intent, and just like it’s always done, the latest round of rhetoric had the effect of raising oil price, which is exactly what the country was expecting. Iran is bracing for a major economic hit after the US reimposes sanctions against the country’s energy industry in November and vowed to implement “secondary” ones against any state that continues to purchase its resources. This will probably shake the Islamic Republic to its core and exacerbate the ongoing protests that are more or less aimed at compelling the government to enact economic reforms as soon as possible (except in the cases when Hybrid War hooligans hijack these demonstrations in order to provoke a police crackdown). The weaponized deprivation of billions of dollars of oil revenue is undoubtedly intended to catalyze political consequences for the US’ chief Mideast adversary, and the authorities will have difficulty containing the aftereffects of this game-changing move even under the “best” of circumstances, to say nothing if its anticipated proceeds prior to that point are lower than expected. The OPEC+ deal between unlikely Great Power partners Russia and Saudi Arabia is conditioned on the need to control rising prices so that they no longer reach the point where US fracking is profitable, which in that scenario would lead to the US cutting into both of their respective market shares. As it turns out, however, the intentional lowering of prices roughly a third of a year before the US’ anti-Iranian energy sanctions kick in is extremely disadvantageous to Tehran’s interests because it’ll unexpectedly lead to less revenue that could subsequently be used to temporarily quell growing public anger over the speculated long-term socio-economic consequences of America’s antagonistic move. Speaking of speculation, this is a strong force in and of itself when it comes to influencing the oil price, something that Iran knows very well and which is why it occasionally crafts passive-aggressive yet “plausibly ambiguous” statements in order to manipulate this sentiment to its desired end. Understandably, Iran wants to rake in as much money as it can from its existing oil exports while it still has the opportunity to do so, paradoxically pursuing its own interests despite always relying on the rhetoric of “collective” ones when speaking about the fate of the nuclear deal. The Iranian state has a responsibility to the its people first and foremost, not to Russia, Saudi Arabia, or anyone else, though the point in drawing attention to this action is to highlight the instruments that Tehran uses to pursue its self-interests, which in the sphere of energy are entirely rhetorical at this point in time. It’s extremely unlikely that the Islamic Republic will do anything aggressive in making Russia and Saudi Arabia “pay” for their “treachery” for taking some of its oil market share, nor will it for that matter rely on military means to follow up on its vague threat to shut down Gulf energy exports through the Strait of Hormuz, though it must be noted that Iran’s threats in other strategic realms should be taken much more seriously because it has the political will to use unconventional measures to advance its own interests. Seeing as how the focus of this analysis is restricted to energy, however, then it can be provocatively concluded that Iran is “all bark and no bite” because it can’t realistically take any action to follow up on its representatives’ words in the manner that they implied, though this was intentional because all that it had to do was “bark” loud enough to trigger the speculative raising of oil prices. Therefore, one can say that this strategy entails zero physical costs but has the chance of producing impressive financial gain for the time being, though the long-term ramifications for Iran’s reputation – especially in the eyes of Russia – might to lead decision makers reconsidering its utility in hindsight. Featured image is from Sprott Money.